After the controversial trade of trouble-making wideout Percy Harvin to the Seattle Seachickens, things must have been getting tense at 9520 Viking Drive. Shortly after the Harvin trade, the Vikings brain trust watched available wide receivers Danny Amendola, Wes Welker, Brandon Gibson, and Anquan Boldin sign with or get traded to other teams. 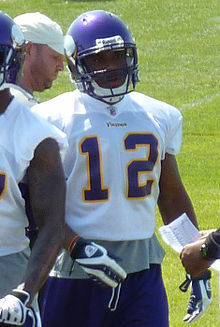 Prior to Friday, the Vikings number one wide receiver was Jerome Simpson. Yes, THAT Jerome Simpson. He of 26 receptions on 52 targets fame. Yikes. On Friday night, the Minnesota Vikings announced that they agreed to terms with former Packer wide receiver, Greg Jennings. Across Minnesota, a collective sigh of relief could be heard. Jennings is the perfect fit for the Vikings offense. Sure, he is a little old for a wide receiver, he has knocked out 29 birthdays to date, but he still possesses the qualities, great route running and steady hands, that the Vikings receiver corps has been missing since Cris Carter hung up his cleats and started whining talking professionally for ESPN. Jennings is great route runner with steady hands in the mold of Cris Carter. And I know what you are thinking, wait a minute, Cris Carter?!? Are you forgetting about Troy Williamso…errrrr…Randy Moss. No. Moss was a great wide receiver, but he just flew down the field and took the ball away from opposing defensive backs with his other-worldly athleticism. Jennings is precise. He uses his route running and physicality to get open 5 to 20 yards down the field. This is perfect. If Vikings quarterback Christian Ponder showed anything last year, it was a hand cannon for an arm. Just kidding, I wanted to make sure you were still paying attention. What Ponder showed was a propensity for making the right play when the down and distance was between 8 and 10 yards. His passer rating in those instances was nearly 100. Jennings thrives on those kinds of plays. In 2011, when he was not dealing with a hamstring injury, Jennings caught only 8 passes more than 20 yards down field. That means 59 of his 67 receptions were for less than 20 yards. And, of that 59, 41 were for 10 yards or less. Right in Ponder’s wheelhouse. The next time Vikings fans see Cheech, he will be lining up across from Chris Cook — in a Seachicken jersey. Jennings’s deal is for 5 years and $47.5 million, with $18 million guaranteed. That is $7.5 million less than the Seachickens just guaranteed former Viking Percy Harvin. On its face, the trade of Harvin for a mess of draft picks (2013 1st and 7th – 2014 3rd) and the signing of Jennings for $1.5 million less seems like a great outcome. Was it tense there — sure. 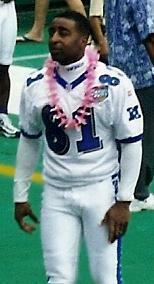 Considering the next best free agent wideout was Laurent Robinson (yikes), the stress was merited. But, in case of emergency, the Vikings went with a tried and true approach. Signing away Packer greats has worked before — think Sharper, Longwell, and, of course, Brett Favre. Getting Jennings make the Vikings a lot better than they were 48 hours ago. However, the current outcome assumes one big thing: that the Vikings could not have found a way to keep both Harvin and Jennings. The ticket-buying public has no idea what happens behind the scenes with Percy. Because he was traded, we can assume there were some significant issues. Percy being Percy. On the field, he is one of the most talented players in the league. A receiving corps of him, Jennings, and the emerging Kyle Rudolph would have been very hard to stop — no matter how well the quarterback played. Unfortunately, we will never know what would have happened had the Vikings paid both guys. The cap room was there, but — at least in Harvin’s case — the attitude was not. Moving forward, with the emergency in the rear view, the Vikings need to nail this year’s draft like they did last year. Another wide receiver (please be Keenan Allen) and a some additional help in the secondary would be welcome additions to a team that is at a crossroads. Either take the next step and become a contender or take two steps back to the bottom of the division. This entry was posted in Home, Vikes v. Pack and tagged Brandon Gibson, Cheech Harvin, Christian Ponder, Christian Ponder Greg Jennings, Cris Carter, Danny Amendola, ESON, ESPN, Green Bay Packers, Greg Jennings, Greg Jennings benedict arnold, Greg Jennings Contract, Greg Jennings Guaranteed money, Greg Jennings Packers, Greg Jennings Traitor, Greg Jennings Vikings, Minnesota Vikings, Percy Harvin, Randy Moss, Seattle Seachickens, Troy Williamson, Wes Welker. Bookmark the permalink.